Star pose is a fantastic stretch for the whole body, it helps to build up strength also improving your balance. Then if you like you can take this to Falling Star Pose. Slide your right leg backwards and raise it a little bit upwards from the floor, shifting your body weight onto your left leg. Lean over towards your left leg, twinkling your fingers, stretching your left hand down towards your left leg, as you stretch slowly down to the foot. Take care to listen to your body and not stretch to quickly, our bodies open up more when we breathe lots! When you are ready, swap legs and twinkle to the other side. Then come back up and stretch back into Star Pose. 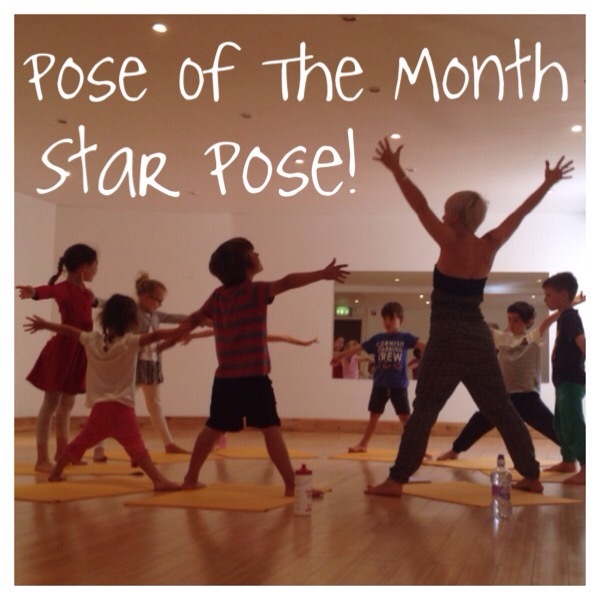 Star Pose is often paired with Rocket Pose in our classes. To move the body from Star, jump in the legs and bring arms together over your head, then back to stretch out in Star. Like doing jumping jacks! See how quickly your heart starts to beat as you switch from pose to pose.